They have never met but they are on the same team. Their uniforms are different but they don them with solidarity of purpose. And though they play different positions, they desire the same outcome. The soccer player and the scientist want to beat cancer. Purple means funding. Purple stands for awareness. Purple gives hope. And the color purple unites them. Is there a prettier color to represent a longed-for cure of this ugly disease? It signifies VAI’s grassroots fund-raising program, called Purple Community, connecting individuals, schools, teams and businesses to the resources needed to join the fight against cancer and neurodegenerative diseases. Purple means funding. Purple stands for awareness. Purple gives hope. And in January, 2017, purple equaled $8,691.89. That was the amount raised by Hope athletes during a Purple Community Game on Hope’s campus. 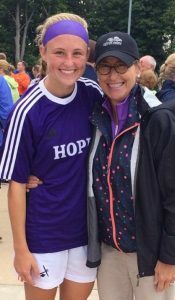 The funds are financing the stipend, and other expenses, for a Hope student to be a VAI summer intern, a unique way Hope athletics partners with Hope academics. Wittenbach is one such athlete. Versluis is this summer’s intern. 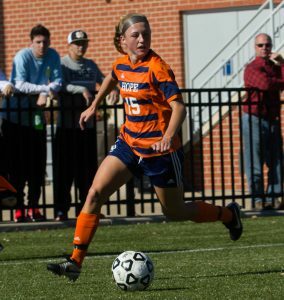 Whenever Allie Wittenbach puts on her soccer cleats — the ones with her mom’s initials, DJW, penned on the white Nike swoosh, and “Never Give Up” written on the sides — she remembers she is playing for something bigger than herself. Every practice. Every play. Every game. When the Purple Community Game rolls around, played in purple jerseys and paraphernalia to bring attention to and raise funds for cancer research at VAI, her sense of loss and hope is even more pronounced. Wittenbach became heavily involved in Purple Community Games long before she arrived at Hope. At her high school, Forest Hills Central, she became a whole-hearted Purple Community member after her mom was diagnosed with cancer in 2010. While there, she was instrumental in raising over $100,000 for VAI ‘s cancer-cure effort. “There is definitely a different feeling in the air that day. On Purple Game day, we are playing for those who are fighting and surviving cancer.” She pauses and her voice trails off a bit but does not tremble. Once at Hope, Wittenbach rallied forces again to raise even more money. Driven and intense, loving and loyal too, Wittenbach just wants to make a difference beyond the soccer pitch. It’s that plain and simple. Her commitment to cancer research is as purple as purple gets. Debbie Wittenbach ended her battle with cancer in November of 2015, Allie’s sophomore year. The woman who knew just about everyone by their first name in her hometown of Ada, Michigan, and who never missed one of her children’s sporting events (Stephen Wittenbach also played basketball for Hope), left a legacy of strength and compassion as well an indelible mark on her community and her daughter. Allie talks about her mom with evident pride tinged by profound loss. But it’s clear she’s not asking for sympathy. She talks about her mom with great joy as a way to keep her memory alive. Philip Versluis commutes to VAI in downtown Grand Rapids from his hometown of nearby Walker, Michigan, long before the traffic gets thick. He takes the elevator to his fifth-floor lab and starts his day by checking the incubator he set up the night before, well after 6:00 p.m. Research is not a 9-to-5 job, he says. It’s dedicated to questions and experiments that have little consideration of a clock. And that is why the whip-smart Versluis likes it. No two days worked, or the results derived, are exactly alike. Even if those days and experiments try his patience and stamina. Versluis has been digging in for three summers now under the direction of Dr. Scott Rothbart, assistant professor in the Center for Epigenetics at VAI, who supervises five other lab assistants too. The two previous summers Versluis worked as an intern funded by the Meijer Foundation. As he continues on with cancer research this summer thanks to funding designated from the Hope Purple Community Game (“For which I am very appreciative,” he says), Versluis embraces the complexities of his work that specifically deals with the mechanisms of DNA control. 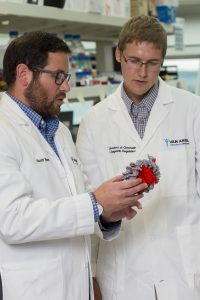 Knowing more about genomic information inside various, specific cells — be they the peculiarities of brain, blood, liver or lung cells — gives researchers better knowledge about molecular drivers of cancer. We expect a lot from human-made technology. So why is it then that we haven’t cured cancer? And it’s the knowing that takes time and money. A lot of time and money. We’ve gotten men to the moon, constructed an information highway, talk on phones that move with us, and built monoliths of modern design. We expect a lot from human-made technology. So why is it then that we haven’t cured cancer? It turns out the human body is much more complicated than any one of those other things. 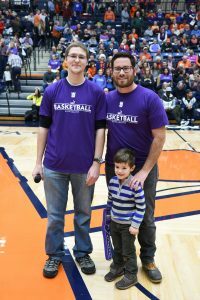 Philip Versluis and Dr. Scott Rothbart, and son, attend a Purple Community Game at Hope. 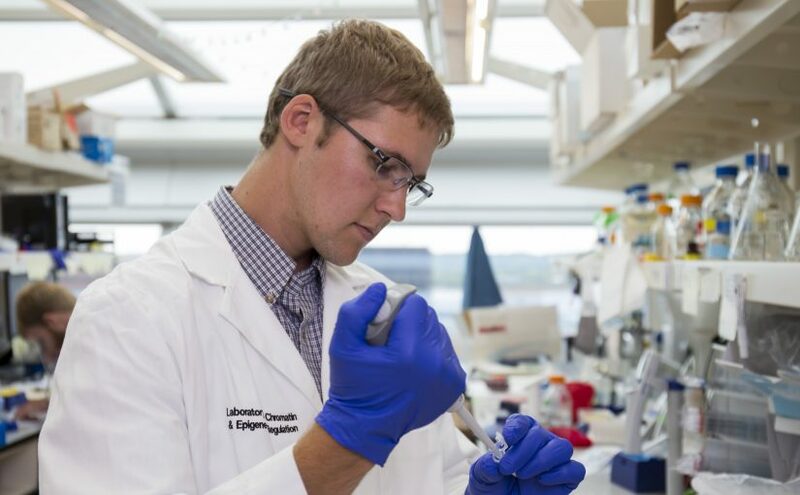 Having assurances like that from Rothbart keeps Wittenbach focused on Purple Community efforts at Hope and inspires Versluis to continue research after graduation from Hope, as he’ll soon apply to Ph.D. programs in molecular biology. The two Hope students may not know each other but they share the same commitment to be the change they want to see in the medical world. The soccer player needs the scientist and vice versa.